Our ranger Jackie tells some interesting facts on her guided wildlife tours running in the Cairngorms National Park. Here are her thoughts on Cotton-grass that can be seen on our nature trails. I have many memories of growing up in the countryside of Speyside and the Cairngorms. The bubbling whistle of the first curlew returning from winter shores, the fragrance of bog myrtle, the vibrant purple of heather blooming, the taste of blaeberrys straight from the hill and the phrase ”the funny thing about cotton-grass is, it’s not cotton and it’s not grass”. This was accompanied by eye rolling from those of us who had heard it a thousand times before and some chuckling from the perpetrator. Unfortunately for those of us who heard it too often, he was actually right. Grasses, sedges and rushes are Graminoids. These are herbaceous plants which have long blade leaves and often occupy areas of open ground such as grasslands and moorland. To a relative beginner, these can at times look quite alike but the short saying ‘sedges have edges, rushes are round and grasses are hollow right up from the ground’ can help with sorting out whether it is a rush, a sedge or a grass you are looking at. As ever there are exceptions to this rule! © Copyright Dennis Thorley and licensed for reuse under this Creative Commons Licence. Cotton-grass, or bog-cotton as it is sometimes known, is actually a sedge. Following the ‘sedges have edges’ rule, a cross section through the stem shows that it is triangular in shape. This is also very obvious if you roll the stem between your fingers. Although there are more than 25 species, we mostly see Common Cotton-grass (Eriophorum angustifolium) and Hare’s-tail Cotton-grass (Eriophorum vaginatum). Common Cotton-grass is often found near bog pools and areas of Sphagnum moss whereas Hare’s-tail Cotton-grass is normally found in areas of wet peaty moorland. In particular on the acidic soils of blanket bog and raised bogs. It is often found growing alongside Ling heather (Calluna vulgaris). In early summer the flowers of Cotton-grass are fertilised. The characteristic cottony white seed heads can be seen when they are in fruit June. This can be an amazing sight with a sea of fluffy white flower heads spread out before you. In addition to the very slightly different niches which Common and Hare’s-tail cotton-grass occupy, the leaves and seed heads are also slightly different. Unsurprisingly hare’s-tail cotton grass produces one fluffy white seed head which looks like a hare’s tail. It also has many thin leaf blades which grow to around 50 cm. In comparison, common cotton-grass has thicker leaf blades and can produce multiple seed heads from the same stalk. They are like flags waving in the wind. 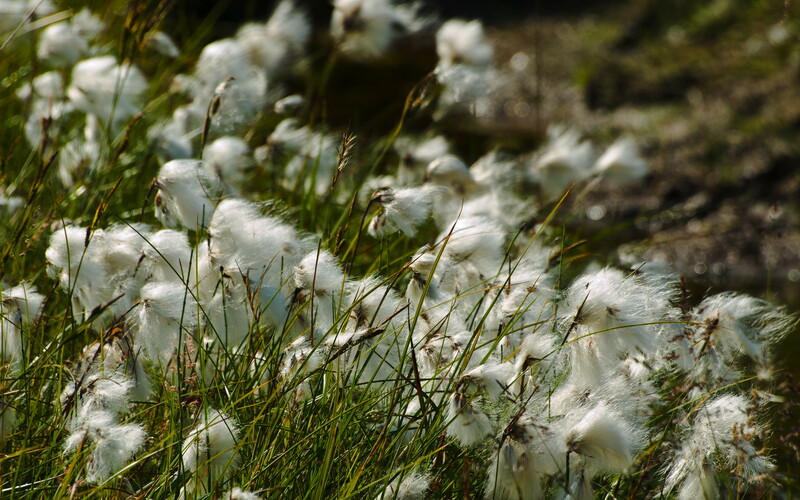 Historically Cotton-grass seed heads would have been used to stuff pillows instead of goose down and were used for wound dressings in the first world war. Native Americans also use the seed and stems of Common cotton-grass in traditional recipes. I’m not sure this is something we will be trying. So when you are next out on the moor and see Cotton-grass, just remember ‘the funny thing about Cotton-grass is, it’s not cotton and its not a grass’!